Redway Runners were out in force again this bank holiday at the MK Marathon and Half Marathon. Ninety Redway Runners completed the marathon in sweltering conditions and a further 197 completed the half marathon. 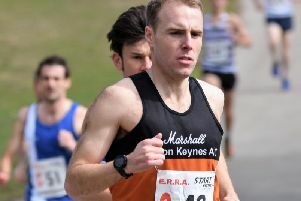 Notable achievements included a 3:23.30 marathon from Jen Sangster who was placed seventh lady overall and a 3:22.10 from Gary Cuilligan, which placed him 35th in the men’s race. Eleven runners on the club's Zero to Hero programme completed their marathon in addition to two completing London marathon two weeks ago. A further six on the programme completed the half marathon or relay as part of their year long journey from being able to run between 0 and 3 miles to running a marathon. The Rocket 5km race also took place over the bank holiday which saw 379 Redway Runners complete out of a field of 1,911.